Friends, welcome to the show. It’s episode 25 today and I’m your host, Miranda Anderson. I’m always so excited to sit down and record for you the things that I have been thinking about and pondering on and experimenting with and my own life. I hope that as I do that and you get to listen to it, that you find that you are impacted in a way that allows you to move forward and make progress in your life in whatever areas you’re struggling with. In today’s episode, I’m going to talk about systems for success and I’m going to address it using some personal examples of systems that I’ve used in my own life and also just generally talk about the types of systems that we create, whether consciously or unconsciously that lead us to all of the behaviors that we exhibit in our day to day lives. We are creatures of habit. We’re creatures of routine. Giving some intention and some thought to the systems that we have in our lives really allows us to dig into making meaningful and lasting changes for our own benefit and the benefit of those around us. Before I jump into the subject, a quick segment, this one is odd jobs. My father owns a commercial construction company in Utah. He founded the company back in the seventies and works on things like schools and government buildings and strip malls and those types of buildings. When I was growing up, the very first jobs that I were ever offered were opportunities to work for him within his company, so very first was as a custodian for his actual office where he worked and his assistant and the other people who worked within his own office building. I would go once a week. My mom had to take me. I was little. I mean like 10, 11, 12. This age was when my sister and I and brothers, you know, we were all given this opportunity and whoever claimed it was the one who got to do it and earn the money so we would be dropped off by her mom. I think my mom would help us a lot of times too. I mean, as a parent now I’m looking back thinking this was a really great circumstance and opportunity that they gave us to make some money and we made real money. I think I made $30 or $40 a week to clean this office. The way that they established that was what they would have paid at cleaning service. Now this is 20 years ago, so this is what they would have paid a cleaning service to clean the same area. That’s what they would give to us when I was a little bit older. In high school. I needed to make money. I worked in a lot of different capacities. I was working in a cafe. I’ve already told you about that. I worked as a nanny for a long time. I’ll tell you more about that in a different odd jobs segment. But I loved making money and I loved working hard and so my dad started giving me opportunities to do the final construction cleaning on some of his buildings before they were turned over to the new owners. What this involved was going onto the job site after most of the subcontractors had finished their work and doing the final cleanup. This isn’t like cleaning someone’s house or cleaning an office building even that has been used. Because this involves a lot of sort of really deep construction cleaning, there would be desks from the drywall all over the place. There would be sticker is still on the windows because the windows had recently been installed and so the stickers were still on the windows. A lot of appliances and different types of cabinetry and stuff would have film on them and so we’d have to go around and take the film off of all of them, just like if you’ve ever bought a new fridge and it comes like it looks blue because they have that plastic covering to protect it. So the construction cleaning involved all of these different ways to pay attention to detail and also just some different skills and techniques. I really loved it. I loved being on the job sites. I felt really grown up being able to be there and working, working really hard. I learned how to clean really quickly, which was nice. I learned a lot of like deep cleaning techniques which I love. I learned how to use a straight edge razor blade for all of my window cleaning needs. Like taking those stickers off. But then also if there was, you know, little bits of cement or concrete or paint splattered onto the glass itself. Of the mirrors or the windows, I could use that straight edge razor blade and just zip all of that stuff off and these are skills that I employ today. Like whenever anything is looking, staying in white ceramic of either a toilet bowl or a bathtub, I just fill it with warm water and you know, put in a half cup of bleach and let it soak and I know that those things will be bleach straight out. I do the same thing with the straight edge razor blade. In fact, when I was painting my back patio door, it has all of these different window panes because it’s a Dutch door and the top has twelve different lights with the framing in between them. On one side I took the time to take off all of the different window panes because I was painting the styles or those little wooden dividers. And on the second half on the outside I realized I can just take the paint off with a razor blade after. So I didn’t even tape it off. I painted and the little edges of paint that got onto the glass. I just was easily able to zip down and take off with a straight edge razor blade at the end and it was really easy and really simple, so I’m super grateful for a lot of the cleaning, understanding that I gained as they work there. The other thing that I really appreciated was there were a couple times when I took larger jobs. This just gave me some trading in entrepreneurship because my dad would give me a large job. It would be a strip mall, so it had five different units. I was given a timeframe and I was also given a budget. This is what they had allotted within the estimate of the building for the final cleaning. Sometimes it would be $2000-$3000, which as a sixteen year old feels like so much money! I realized very quickly that if I could do it fast, that my dollar per hour became exponentially higher. I also learned quickly that I could hire my own friends (and pay them more than they would make it any other job at their ages) to come along with me and then I became the owner of the cleaning project, so I was just, you know, started to operate in this entrepreneurial way. So there are a couple job sites that come to mind when I think about this that I hired between three and four friends, high school friends and I would pay them $10 to $12 an hour, which you know, at that point, this was again 20 years ago and things are really different as far as minimum wage and everything else. We were all working, you know, these other little cafe and restaurant and retail jobs where we were making $7 an hour, so being paid $10 or $12 an hour, all of the sudden felt like a lot of money for them. But I would at the end of the project, he know a whole weekend of working pay out maybe five or $600 and then I would have earned myself two or $3,000 on top of all of my expenses. I bought all the cleaning supplies and all of that, but it was just a crash course in the way that this system could work, that you could work hard and work smart and everyone, it could be a win for everyone. Job opportunities for my friends, I’m probably a little bit cheaper than it would have been to pay a big cleaning company to have a bunch of high school students do it. I got to learn how to be in charge of expenses, in charge of, you know, paying other people and also in charge of the responsibility of if something hadn’t been done quite right or if they notice something needed to be done again, that I would take that responsibility and go back out and make sure that it was all according to standards. So this was a really cool opportunity and I look back and realize how it impacted a lot of different things that I’ve learned and the ways that I have understood business in my lifetime. And so I’m super grateful for the chance that I had to work in construction cleanup for my dad back when I was in high school. It also really makes me want to create jobs for my kids where they can have similar opportunities. I don’t own a construction company so it’s not going to be the exact same, but just providing opportunities for my kids to work and earn money and think about being in charge and having responsibility I think is a really valuable skill for their lives. Whether or not they go on to be entrepreneurs, they’re not. So those are the thoughts that I’ve had today. That is my odd job. If you follow me on Instagram, I’m @livefreemiranda over there. If you don’t, you should hop on over and we should be friends there as well. It’s a fun place to hang out and I spend a lot of time sharing experiences and ideas through my stories and also just sharing content that I think has value in the feed. And for those of you who have been following along, you know that I recently finished the first draft of the manuscript for my upcoming book and I have to tell you that the process has been so interesting and has really caused me to think a lot about systems and habits and routines. Part of that comes simply from the fact that the book is about some systems and habits and routines that are family employed during our year of not shopping. If you haven’t heard about our year of not shopping, you can go back to episode four and I share all about the ins and outs of that experiment that we did in 2017. 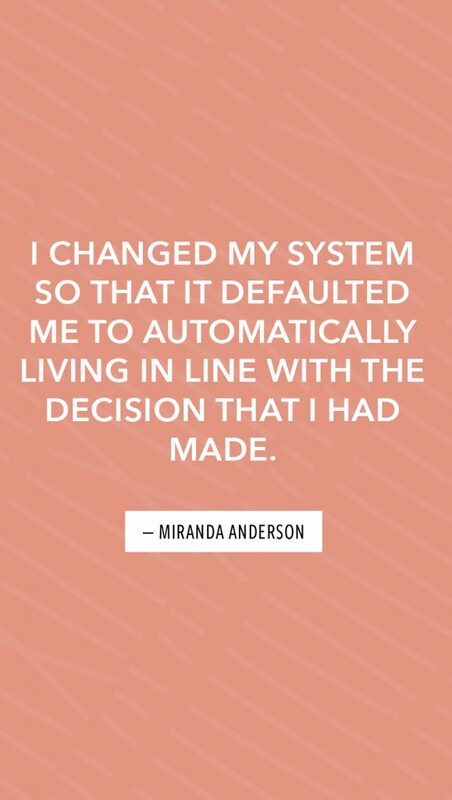 One of the things that has struck me as I had been writing about it and sharing the lessons that we’ve learned through that experience was how we created a system to replace the system that we were trying to change. In this case, the system or the routine that we were in the habit of or that was part of our regular life was shopping, shopping. Mindlessly going into target for groceries and coming out with groceries plus a new bench plus about thirty-five dollars worth of things from the dollar section plus a new pair of shoes for Plum because they were really cute and they had sparkles on them and she wanted them. Plus maybe a sports bra because I saw a cute one and I mind we’re getting a little ratty but I probably didn’t need it, but it was on sale so I got it anyway. If anyone relates to that, that was kind of that system of shopping that we had in place. Wandering into Costco right at the beginning of the spring when they start putting out all of their summertime stuff. I think the summertime stuff at Costco is like the very best. All of the umbrellas and the folding chairs and the big fluffy striped beach towels and all these things that just make you excited about summer and looking forward to it. And you immediately can think how this summer is going to be the better the best summer ever, especially if you have all of these particular accoutrements to add to your arsenal for summertime enjoyment. That was the system. In order to have the no shopping experiment be successful, we needed to change the system. We made the decision to stop shopping for things that were non consumable goods and you can go back to the episode or read on my blog about all of you know, what the guidelines of that particular experiment entailed. I realized very quickly that in order to be successful with this challenge of not shopping, that I needed to alter our system. I needed to alter my routine and some of the first things that I did were one to delete all of the emails in my inbox that came from retailers that regularly tempted me with their sales. I actually used a service called unroll.me and it’s a free email service. It will show you all of your subscriptions. It’s staggering how many, if you’ve never done this before, you should do it it. It’s staggering. You will have, I’m guessing the average person has between 100 and 300 regular subscriptions that they’re part of, you will not even believe because a lot of them are sort of subtle and maybe they don’t send you emails all the time versus the ones that you get emails for every single day. I first went to unroll.me and I deleted all of my retail subscriptions, so the only emails I was receiving were newsletters of people that I really appreciated what they were sharing or friends and family or you know, things that gave me more information than it did sales. The second thing that I did was decide that I was going to shop at the same place for my groceries, which generally was Trader Joe’s. I lived nearby a trader Joe’s. I loved it and that’s where I’ve been shopping for a long time. So between trader Joe’s and Costco, those were kind of my two. Those were the two places that I was going to be buying my groceries and groceries is really the main thing that I needed to buy. Once in a great while I needed to run in to an office supply store or for something particular, you know, replacement item at a particular store, but for the most part my routine was to not like my new routine. The system I was creating was to only shop at stores that didn’t offer me all of the things that I would be tempted to buy otherwise. So at trader Joe’s, they don’t sell clothing or shoes or cute home decor items and so when I was buying my groceries and I knew that they would have what I needed in terms of groceries, I wasn’t derailed into the aisles serving me everything else that I might possibly want or need. The other thing that I did was to establish some routines to help me feel better. And I talk a lot about this in the book. There’s a whole chapter on this. Help me feel better that didn’t involve shopping. Maybe that sounds silly, but I think it is a true thing. It is a real reality for us. A lot of us in this society in this age that shopping is one of the solutions that we use in order to make ourselves feel better. When we don’t feel good. That’s one of the things that we do to try to heal those feelings. Well, I mean it goes without saying that it doesn’t always work and so I knew that I would still have unpleasant feeling sometimes I’d be frustrated. I would be overwhelmed. I would be, you know, at the end of my rope as far as mothering and all of those things and I needed to have systems in place for what I would do if I wasn’t going shopping. And so I did start to do some different things. I would go take a bath and just sequester myself into the bathroom. I would light a candle to create this like nice who get atmosphere. I would bring a good book and I would soak in a bubble bath and I started investing in things like bath bombs and like special bath soaps and things that I never had thought were very worthwhile before. These were consumable items that then would help me choose a bath instead of a target run in order to feel better.Other things like going on hikes or I’m going to the gym. Those are things that became replacement routines for shopping. So that is just one example of changing a routine. Choosing the goal which was not shopping, but that having to set up a system. 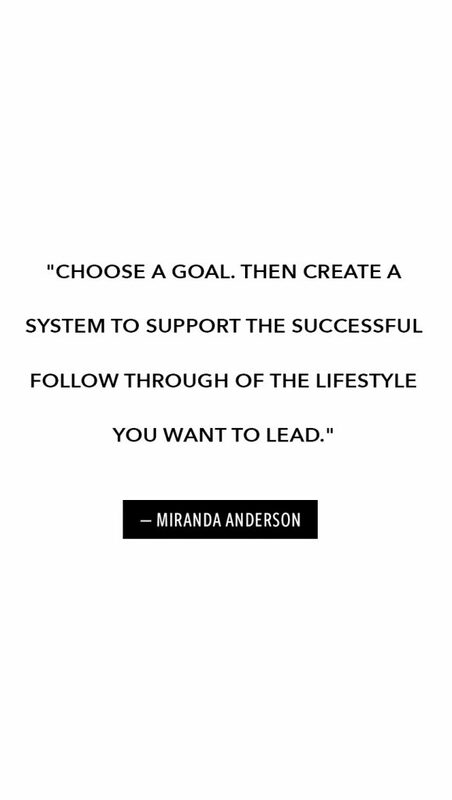 Not just have a goal, but create a system that supported that goal. That supported the successful follow through of the lifestyle that I wanted to lead. I’m going to give you another example, and I’ve talked about this a lot, but it’s, it has been really interesting for me to look back on and reflect on this. In between 2013 and 2017, I drank a lot of Diet Coke. I drink it in addition to other beverages as well as other types of diet sodas. I went on a Coke Zero thing for awhile when Diet Coke came out with all those new flavors of like the mango and cherry and all of those things. I like dove right in. I wasn’t drinking a whole lot of water. My system, or the default was to drink at least one Diet Coke a day if not more. And there were really short time periods when I would kind of go off of it, I would try to go off of it by not drinking it for a couple of days. I would just drink sparkling water or I would do like a quick challenge just to like do a little mini detox. And then I would find myself very quickly jumping right back on board with that. Part of me felt like I didn’t want to change. And if not, do I, am I willing to change it? Am I interested in actually working on this or not? I was also recognizing my kids were drinking a lot of Diet Coke even though they technically weren’t allowed to because if that’s what I had either in my hand or in the car and they needed a drink, I would let them have a drink. And so whatever I was drinking as well, especially my youngest who was with me a lot, that’s what she would end up drinking. And so I took advantage of the opportunity in October to only drink water for the whole month. And I think part of the difference was that mentally I was ready. I had decided that this is something that I wanted to do. I wanted to be a person who drank water. I was ready to separate my identity from being a Diet Coke mom to being a Water Mom. I was excited about that and I felt good about that. And so what I did was need to set myself up a new type of system to support it. I realized really quickly how interesting it was that I would automatically be driving towards Sonic or Mcdonald’s or 7-11 first thing in the morning instead of going to the gym or going to where I wanted to go. And so I started filling my fridge with sparkling water because I really love the bubbles still. And I felt good about that. I defaulted like I just defaulted to water for that whole month. And so when I went out to a restaurant where I normally the default was Diet Coke, I flipped the switch. The default was then water and I took the decision making out of it, which became really powerful. I altered the system. I had a bottle of water with a straw. I really like drinking through a straw for whatever reason, and so I have a bottle of. It’s not fancy, it’s from The Alison Show, actually her Super Duper Fly Alaska Podcast tour. It’s just a clear plastic water bottle with a straw and being able to drink through a straw but drink water through a straw became my norm. The point of sharing these examples, and I’m going to share a couple more, is that I didn’t just set a goal. I didn’t just make a decision. I then made lots of little decisions to support that overarching decision. This one might make more sense too. So let me share another experience. Again, what I’m talking about here is we have, we all, all of us have routines that are passive routines. We live our lives systematically. Humans are creatures of habit, and so when we aren’t actively one hundred percent engaged in our decision making process, we are living passively in the routines that we have set for ourselves. Our brains simply do not have the capacity to be firing on all cylinders all the time. I was reading in a book recently that about eighty percent of the time we are living passively. We’re thinking about other things. We’re thinking about ideas, we’re thinking about plans were thinking about the future while our actual physical body is going through the motions of something else, so it’s that. What are you going through the motions of? What is your passive routine that you’re automatically living? What does that look like for you? What are you automatically reaching for, for your nutrition? And your beverages, what do you automatically doing to move your body or not move your body? What do you automatically doing in terms of your consumer habits? And really, you could go through your financial habits, your work habits. You could go through every different area of your life and think, what is my baseline? What am I doing automatically right now? That is your passive routine. Those are your habits. Whether you like them or not is beside the point. The interesting thing to understand is that we all have that. We have this baseline of whatever we do when we’re not thinking about what we’re doing, that’s our baseline. 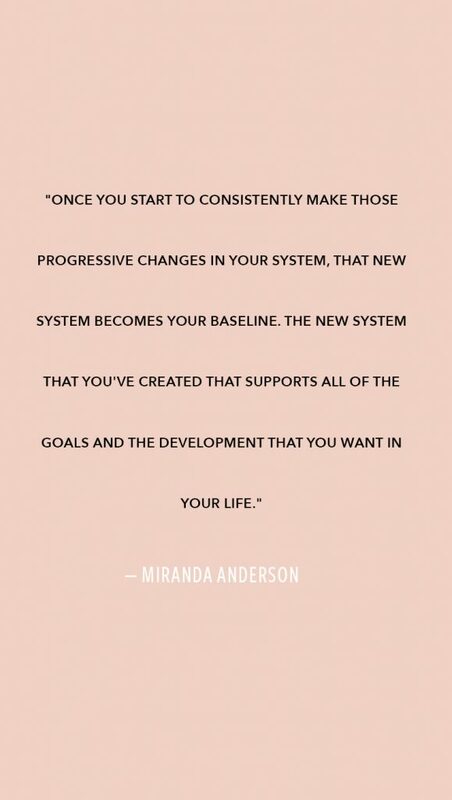 And when we set goals or when we want to make changes, we can’t just decide we want to make a change and not think about specifically implementing a system to replace the passive system. What we do is we create a new system that becomes a progressive system. And at first that’s really can feel hard. At first it can feel difficult because you are actively choosing things each day. You’re actively deciding to not go to McDonald’s and instead to drink your water. You’re actively not sleeping in until ten, but getting up and going to the gym. You’re actively choosing these things and so it does take more willpower. It takes more confidence. It takes more brain power. You will feel a little bit more exhausted is you’re choosing those things, but here is what I wanted to get to and I’m going to share some more examples, but this is the important thing. Once you start to consistently make those progressive changes in your system, that new system becomes your baseline, the new system that you’ve created that supports all of the goals and the development that you want in your life. At some point when you do it enough times, that becomes your baseline system and that is that’s how you change your habits. That’s how you set yourself up for success by creating a system to support the lifestyle that you want to lead. So let me give you a quick example from my sister. I think that her success rate as far as exercise is going to be phenomenally higher because of the systematic approach than it is to a goal setting/accomplishment approach. I hope that you’re getting something out of these examples is I’m sharing real life examples. My hope is that you can think about your own life and about some of the things that you would like to change, some of the areas of your life in which you would like to make progress, and my invitation is for you to intentionally think about and consider setting up a system rather than setting a goal. Think about how the surrounding activities will support in whatever you really hope you want to do and how to affect change in those surrounding activities or that particular routine. I have two more quick examples. The first one is with our new meal plan. I told you a couple episodes ago in the minimum meal planning episode that we are back on eating the same seven meals every week and I particularly designed those meals so that they would be in alignment with our current nutrition values that we want to eat, leaner proteins that we want to eat, some plant based diet meals that we want to eat, a lot of fresh vegetables. We designed our meal plan around our values. Also, in November joined a sugar detox cleanse. Now the cleanse didn’t begin until January ninth, but I decided back in November, so this is right after Aguatober. I already talked about the effect that choosing to only drink water hat on my system, that I wanted to live more aligned with my values as far as fueling my body with food and beverage. I joined this sugar cleanse and thought I really do want to not never eat sugar again, but I want to get on a better track. I want to set myself up for for greater success in regards to eating more healthy foods. So the combination of the meal planning and this sugar detox have been really fantastic. The system that I realized I needed to create was regarding especially the types of foods that I was shopping for. So if you want to eat more healthy, if that’s a goal that you have and you do most of the shopping for your household, that is a very upstream solution. When you go to the grocery store, the things that you bring home are going to be the things that you eat. Starting to be more considerate about what I actually am putting in my basket and bringing home has been really instrumental. I am choosing more fresh fruits and vegetables, especially easy ones like carrots and celery, which maybe aren’t my favorite vegetables, but they’re the ones that are easier to eat on the go. I am making sure we always had apples– we’re in the middle of winter right now, so we have apples and oranges. There aren’t a lot of other fantastic fruits in season right this second. But I have wanted to be eating healthy all along. I’ve wanted in my head to be eating healthy, eating whole foods and not eating junk all the time and yet I was still regularly buying treats that would derail me from my greater goal, which was to eat in more alignment. The other thing that the sugar cleanse has done in particular and the meal plan both combined, like I think this has just been a great combination because it’s fundamentally shifting the routine because I know what I’m making for dinner every night. I am able to start preparing it earlier in the day and even sometimes the day before, which is counterintuitive because the whole point of the meal plan is to be able to really simply pull out a quick meal when it’s dinnertime. But I’m finding that it’s easier for me to cut up a bunch of vegetables and put them into roast in the afternoon while I’m home, you know, folding laundry or doing something else and then they’re ready to quickly add to the dish really easily or to put in the fridge. I’m meal prepping all along the way and really enjoying it because I know exactly what I’m making and I’m know what meals I want to create so we’re often having exactly what I planned on and having enough for leftovers for me to eat the next day. So I’m setting myself up for success by altering the routine. By not leaving it to chance. Not just saying I want to eat healthy, but then doing the same thing that I’ve always done. I’m saying I want to eat healthier and then I’m shopping differently. I’m preparing meals differently and I’m creating a system that is sustainable to allow me to do those things. The last example that I want to share, and so this is just a podcast full of examples and I hope that some of them are helpful and that you can think about your own routines, the own your own systems that you’re creating and how you might be able to set yourself up for success when it comes to living the life that you want to live. The last example I want to share is about my bedtime routine. My baseline for for a while has been to watch a show with Dave before bed. Now this is maybe different than it was before because we have never had a TV in our bedroom until we moved into this house. There’s no other place for our TV right now. We’re planning to put it into the clubhouse as soon as we in the spring, renovate our shed into a kid’s clubhouse. For now it’s in our bedroom and so at night we get ready for bed and then we lay down and choose a show. Lately it’s been a lot of comedy specials on Netflix and we watched the show and that has been great and it’s fine. I love hanging out with Dave and watching a show and laughing together. In the beginning of January when I decided to get very serious about figuring out my book and writing it and getting in, you know, going through the process of making this happen, I decided I was going to write in the book every single day. I had it all outlined. I’ve had it outlined and scheduled, you know, for months and months and months. So I knew what I needed to write. I just wasn’t taking the time to write it. And so I set myself this goal I’m going to write every single day. It doesn’t matter how much you can be a sentence, it can be five pages, it doesn’t matter. I just have to write something within the pages of this book every single day. I found that most days my routine during the day was pretty normal. Getting the kids off to school, you know, doing the work that I need to do for the contracts and things that I already have in process for my blog and my business and all of the different things that I do in a normal day and I wasn’t getting to writing until the nighttime. And so I would put the kids to bed and then I would tell Dave I need to write because I had decided I need to write every single day. I switched our evening routine. I started writing. Instead of watching Netflix every night, I wrote words every night, every single night, and I continue to write words. Right now I’m in the revision part of this manuscript, but I still am writing every single night. I’m not having time to watch Netflix, which I love Netflix, but I recognized my system needed to change to allow me to live in alignment with the goals that I had set. And so I have this goal of sending this book out into the world and I cannot do that if it doesn’t get written, I can’t simply. It will not exist in your hands ever if I don’t take the time to write and edit it. So aligning myself with this greater value by creating a system that meant every single day at night before bed, “I’m going to write a little bit before I fall asleep,” has been absolutely instrumental and really just opened my eyes up to how much time I actually have. If I pay attention, how there are little pockets of time here and there where I can accomplish the things that I really want to accomplish if I choose to. 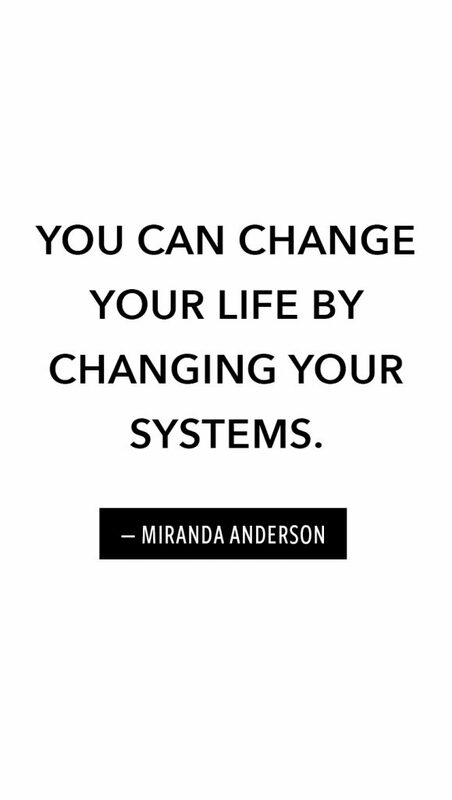 You can change your life by changing your systems. If you set up your systems in your life so that your default actions are aligned with the life that you want to lead, you will find yourself feeling so fulfilled and so content and so grateful that you’re able to accomplish all of the things that you hope to accomplish every single day. As a final invitation at the end of this episode. I want you to think about one system, one area of your life that you would like to exercise, some change that you’d like to see be a little bit different, a little bit better, a little more aligned with the person and the life that you want to be. Consider not only the specific goal or the specific elements that you would like to change, but think about the passive routine that is upholding whatever your current behavior is and then think about how you could alter the system. Not the one behavior. Not not eating more cookies or exercising 40 hours a week, but what is the system that is currently supporting that behavior in your life? Intentionally consider how by altering the system itself–by changing the routine– you might set yourself up for success to live more in alignment with the type of person that you really want to be. Thank you so much for being here. I hope that you’ve enjoyed this episode. As I shared some examples of passive systems and then purposeful systems. The way that you can alter simple systems in order to affect great and lasting change in your lifestyle. 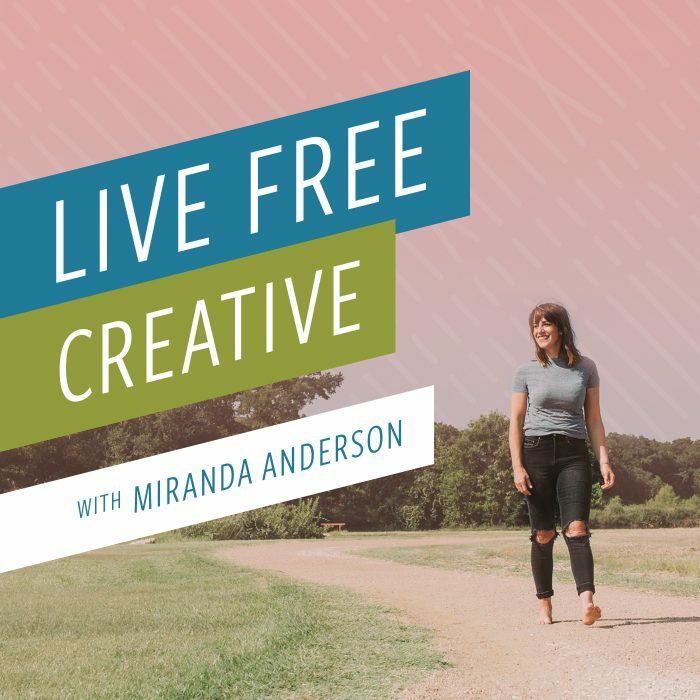 I’m so happy that you have found Live Free Creative, the podcast. I’m happy that you’re here and that you’re giving me your time and attention, which I do not take for granted. I don’t underestimate the value of your support. I want to thank you so much. Those of you who are leaving ratings and reviews at iTunes and in fact I’m going to share overview with you right now and we’re going to send this reviewer a special package in the mail to say thank you. If you would like to leave a review, you also are eligible. All of their reviews, we go through them, we read them all. I appreciate them so much and we pick one every couple episodes to send a special package too, so please, if you haven’t done that yet, I would love for you to hop over and leave a review. I thank you so, so much for listening, for using the information and the ideas that I share to make your life a little bit better. That is my goal. That is what I’m here for, to help you feel like you are in control of making your life a little bit better. Every single day.